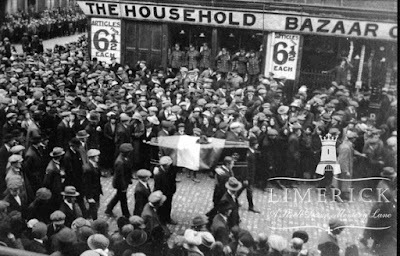 Richie Venton: THE LIMERICK SOVIET, 1919 - when workers ran the city! THE LIMERICK SOVIET, 1919 - when workers ran the city! 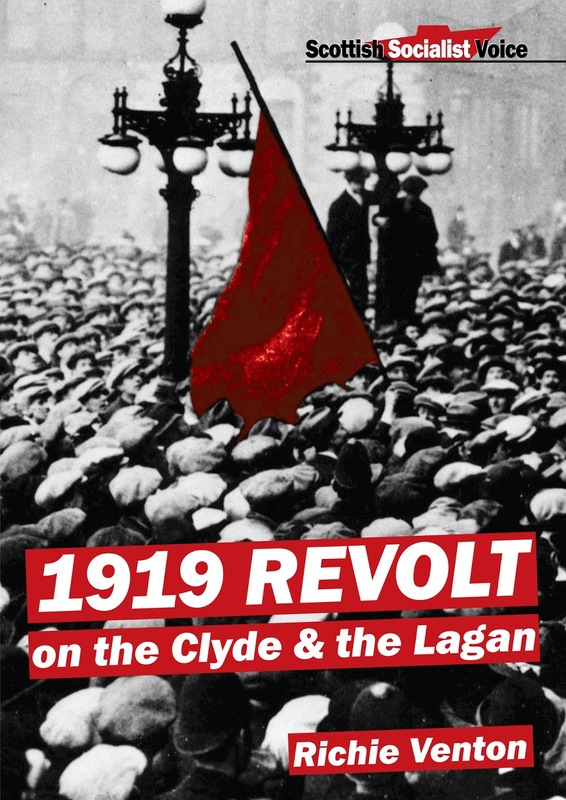 This year has a bumper crop of very significant centenaries for workers and socialists, but one that barely merits a mention in Scotland or Britain is the Limerick Soviet of April 1919. 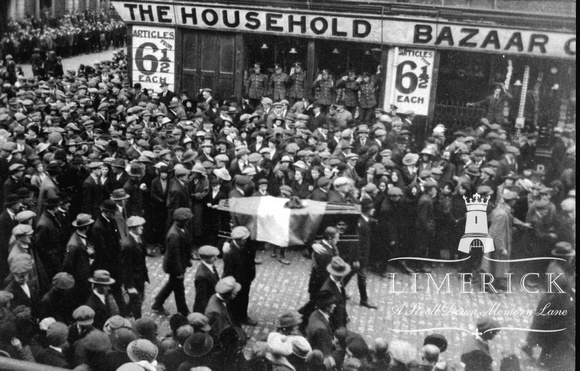 This was a two-week general strike in Ireland's west-coast city, commencing Monday 14th April 1919, primarily against the declaration of martial law by the British government, with military occupation, which provoked outrage from most of the 40,000 population. For at least ten days, the elected Strike Committee seized control of all the major decisions over production, transport, food supplies, law and order, energy supplies, propaganda – and even produced their own currency! It was a movement that terrified the ruling capitalist class - not just of Britain, but also the aspiring native capitalists of Ireland, who were hell-bent on gaining the power and privileges of an independent Ireland for their own class. Their dread of “the most approved soviet methods" has to be understood in the context of the time. This was a mere five months after the workers and peasants of Russia had seized power, ruling through Councils of directly elected and immediately recallable delegates from the workplaces, military units and peasants. It was pre-Stalinism, when the young workers’ state was a shining beacon for workers across the globe, Ireland and Britain included. ‘Soviet' was simply the Russian word for Council or Committee; the vibrant and democratic forum for decision-making by the toiling masses, in the early years after the 1917 socialist revolution. The Times, military chiefs, capitalist overlords and their government puppets had every reason to look on in dread at equivalent developments in their own first colony, with the potential of the ‘contagion’ spreading to British cities. Especially those with large Irish populations, including those like Glasgow which had just been through the tumultuous battles of the Forty Hour Strike, mere weeks prior to the Limerick Soviet. Limerick 1919 was a powerful link in the chain of revolutionary events that spread across the island of Ireland, particularly in the years 1918-23. Prior to the First World War, a rash of strikes involved particularly newly-organised, super-exploited sections of workers, such as the Belfast dockers, women in the Belfast mills, Wexford foundry workers. As the British government made parliamentary preparations for Irish Home Rule, native Irish capitalists fought ruthlessly to put Irish workers in their place, to stifle their demands and aspirations. This culminated in the 1913 Dublin Lockout, orchestrated by William Martin (‘Murder') Murphy – described by Jim Larkin as “a soulless, money-grubbing tyrant” - and the Dublin Employers’ Federation, who starved and brutalised men, women and children, in their mission to smash the growing forces of trade unionism, led by the likes of Jim Larkin and James Connolly. It was during that showdown between two Irish classes that the Irish Citizens Army (ICA) was formed, to defend the strikers. When the ICA went on to join forces with the nationalist Irish Volunteers in the 1916 Easter Rising, it was no accident that Murphy used his ownership of the Irish Independent to bay for the blood of Connolly in particular; he recognized the great Marxist workers’ leader as a mortal threat to the upstart capitalist class of Ireland. Connolly’s execution by British imperialism, and Larkin’s departure to the USA (and subsequent jailing there on charges of sedition against the war) beheaded the Irish workers’ movement in the period after the War – the period of greatest potential for workers’ power and socialism, and the time of greatest need of experienced, capable socialist leadership in the workers’ movement. This was to be underlined in red in the events of Limerick, and indeed throughout the period 1918-23. 1919 kicked off with the Belfast general strike for a shorter working week, without loss of pay, during which Protestant and Catholic workers united and controlled the city for 4 weeks, in a momentous challenge to the ruling capitalists, their politicians and their state - which we have described elsewhere, in my pamphlet 1919 REVOLT. Limerick was a city of abject poverty, slum housing and grossly over-crowded conditions, but also with a working class population imbued with rebellion and resistance. The militant, growing ITGWU union had, by late 1918, over 3,000 members in the city, and its main organiser was a Marxist, Sean Dowling. 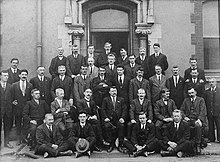 The Limerick United Trades and Labour Council had substantial authority, coordinating many protests and strikes. As the mostly rural guerilla-based War of Independence raged, an attempt was made by the IRA to rescue a local member and hunger-striker, Robert Byrne. In the melee, Byrne (and an RIC officer) were shot dead, provoking fury in the local population, who hated the RIC as the paid agents of Britain and the Irish capitalists. About 10,000 assembled as Byrne’s body was removed. The British authorities feared an escalation of the unrest after his funeral and used the repressive Defence of the Realm Act to declare most of Limerick a Special Military Area (SMA). This meant martial law, with thousands of workers forced to show military passes to army patrols on their way to and from work, which inflamed people further. On the day of the funeral, thousands marched and lined the streets, as British troops lined the route, bayonets fixed, accompanied by armoured cars and overhead military planes. Immediately, the workers of Cleeves Condensed Milk factory pressed the Trades and Labour Council to meet the day before the SMA was set to take effect. After prolonged discussion, the meeting decided to call a general strike from the following day, Monday 14th April. About 14,000 workers responded the first day, with growing numbers later. What followed was a glimpse of how the future could have been. The Strike Committee and a series of Sub Committees took control of the city for ten days. The workers’ committees exposed any attempts at profiteering by shops and shut them down. Red Guards were deployed to enforce the decisions of the Strike Committee, including price controls. In defiance of blood-curdling predictions of famine in the city by the hostile capitalist press, the general strike organisers’ Food Control Committee set up a food depot outside the city, across the river Shannon, and got ample supplies from farmers in County Clare. These supplies of essential food were then smuggled past the army sentries in boats with muffled oars, and in hearses! The people were fed at fixed, low prices through food depots inside the city – proving the social benefits of eliminating the profit motive! And as bemoaned by the frightened Times editor, they printed their own currency during the second week of the Soviet, calling them Labour Notes, which were accepted in the shops. This act, perhaps above all others, symbolised the degree to which the working class had forged a rival power to that of the British government and its martial enforcers. And for the Soviet’s duration, with the workers taking control of law and order, the city was a model crime-free, peaceful enclave. A glimpse of how society might become; an example the capitalist state couldn’t afford to allow to survive too long! In contrast to the widespread hatred towards the RIC police, sound class instincts and creative leadership led to appeals towards the British soldiers, worrying the army top brass that they couldn't rely on the conscripts to mete out full frontal repression and assaults on the strikers and their working class army of supporters. From the outset, the local Strike Committee looked towards the national trade union and Labour party leadership to spread the struggle, in particular by calling a national general strike. We can, of course, only speculate what Connolly and Larkin would have done if they’d been alive or in Ireland, respectively. But their entire track record as fearless workers’ leaders suggests they would indeed have used their positions in the leadership of the large and growing ITGWU, and as key founders of the Irish Labour Party in 1912, to build for a national general strike. Furthermore, their record of uniting Protestant and Catholic workers in the north east of the country would have been invaluable in such a workers’ movement, in sharp distinction from the suspicions, even hostility, the pro-capitalist, nationalist Sinn Fein leadership evoked amongst Protestant workers. Not so the leadership who took over from Connolly and Larkin. Tom Johnston and William O'Brien had caved in to the appeals from the Sinn Fein leadership to stand aside in the December 1918 general election; to give Sinn Fein a clear run, and ‘not split the Home Rule vote’ - under the pernicious slogan ‘Labour must wait'. 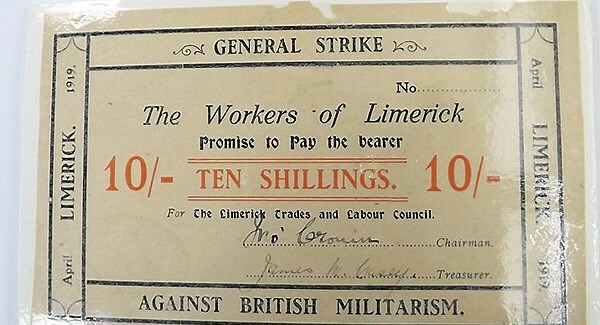 In keeping with this collaboration with the anti-strike, pro-capitalist Sinn Fein leadership, the Labour and trade union leadership shrank from any suggestion of building a country-wide general strike in solidarity with the Limerick Soviet. 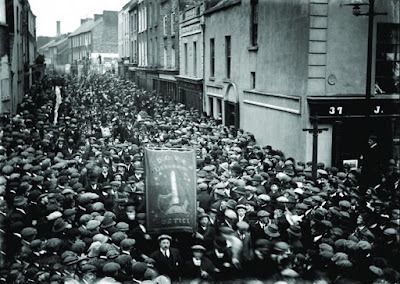 They had talked of calling a ‘national holiday’ on May Day 1919, but were terrified at the thought of the Limerick workers’ challenge to capitalism and its state forces feeding into such a national stoppage. 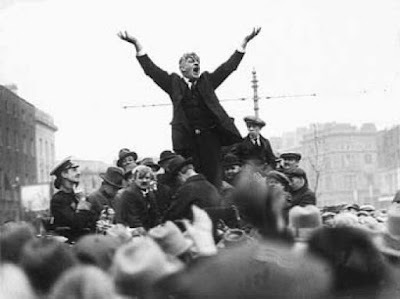 When one of the usually-moderate leaders of the Strike Committee, Sean Cronin, met with the national executive of the Irish Trade Union and Labour Party, six days into the Soviet, he reflected the far-reaching demands of the combatative Limerick strikers - by calling on them to replace the local Strike Committee and make Limerick the headquarters of Ireland’s national and social revolution! Horrified at such a scheme for leading a challenge for power by an already-aroused and agitated working class – who were engaged in strikes in Dublin, Drogheda, Wexford, Dundalk and several other parts of the country at the time of Limerick – the Irish Trade Union and Labour executive deliberated a couple of days and instead brought forth the crackpot proposal of a total evacuation of the entire city as a means of protest. Where to? How? Why?! In fact, this bizarre idea had first been raised by Sinn Fein in the Dail, as they wriggled to find a way of defusing the class showdown in Limerick, only then to be adopted by the Labour leadership. It was a complete abdication of leadership, one strand to their betrayal of what could have been built into a mass workers’ movement on social issues taking leadership of the national struggle for self-determination, pursuing an independent socialist Ireland – with high prospects of uniting workers in the north east around this class-based struggle, hot on the heels of their own recent general strike in Belfast in January/February that year. Given that 70% of Irish trade unionists were members of British-based unions then, such a socialist challenge for workers’ power would have undoubtedly fed into the agitated state of consciousness of millions of workers in Scotland, England and Wales in the same post-War upheaval. Probably precisely because they had at least a glimmering of what was at stake, in their craven desire not to unleash a mass workers’ movement they couldn’t control - and not to upset the applecart of a capitalist system they were increasingly buying into, and had no vision of overthrowing - the leaderships of both the British and Irish trade unions and Labour parties made their tactical moves. They openly declared opposition to the continuation of the Limerick general strike, around 22nd April. This emboldened the military general staff, led by Brigadier General Griffin, and the Limerick Chamber of Commerce. From the very early days of the Soviet they'd been meeting, seeking a ‘solution’, at first offering the utterly unacceptable ‘concession' of employers issuing passes to their workers, instead of the army issuing military permits. Griffin had played a waiting game, probably unsure of his troops’ loyalty if they were deployed prematurely against strikers; one Scottish regiment had been withdrawn when they refused to obey orders. 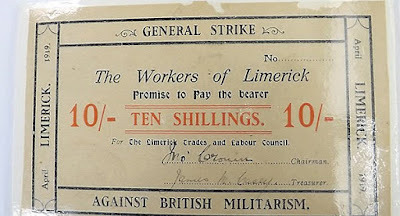 But when the British TUC leaders scandalously came out against Limerick on the 22nd, and the Irish trade union and Labour Executive arrived there the next day, Griffin made his move, offering that no military passes would be required for workers going to and from their meals. This satisfied the other two forces who had been meeting with the military and business bosses, desperately seeking a way of ending the Soviet – the Catholic Bishop Hallinan, and Limerick’s first Sinn Fein Mayor, Alphonsus O'Mara. These two piled renewed pressure on the Strike Committee to capitulate, whilst the Pontious Pilates of the Irish Trade Union and Labour ‘leadership’ – including O'Brien and Johnston – stood by in alleged neutrality. 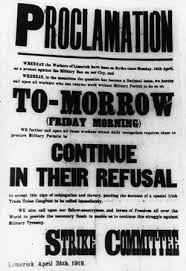 On the 24th April, the Strike Committee issued a Proclamation instructing those workers without need of military permits to return to work - a partial end to the strike – and by 27th a complete end to the strike was reluctantly declared. 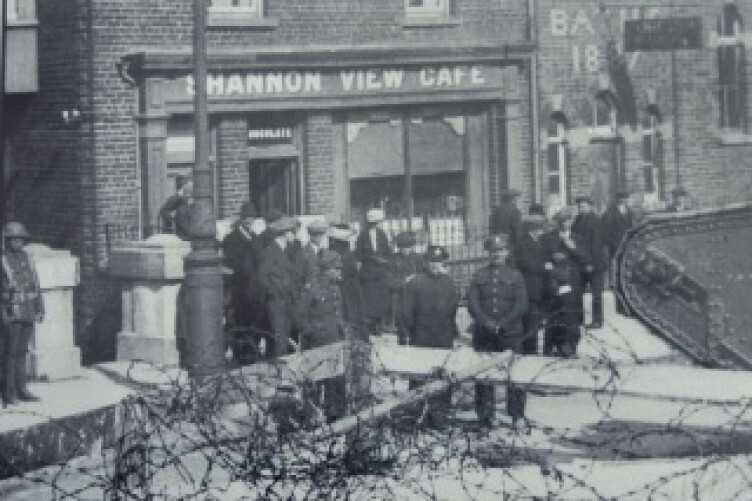 The power of this heroic and ingenious struggle by Limerick’s workers forced British imperialism into a rapid retreat; a week or so after the Soviet had ended, on 5th May, the military permits were entirely scrapped in the city. 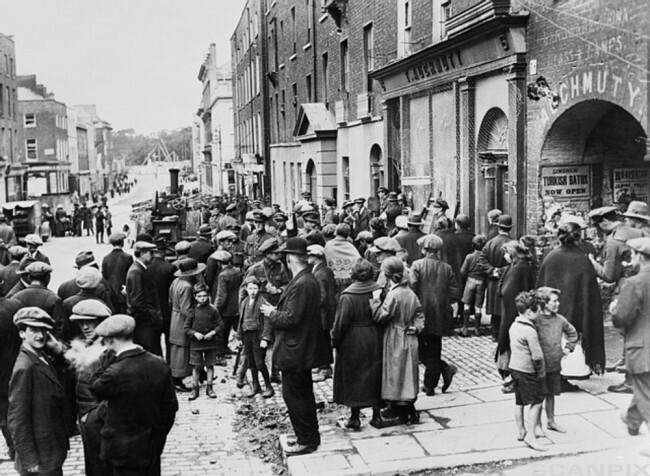 The ruling powers had overreached themselves, provoking a general strike and workers’ seizure of control of the city - endangering the security of their own capitalist power and privilege, had there been a capable, resolute socialist party and leadership to give strategic and tactical guidance to workers in Ireland at the time. 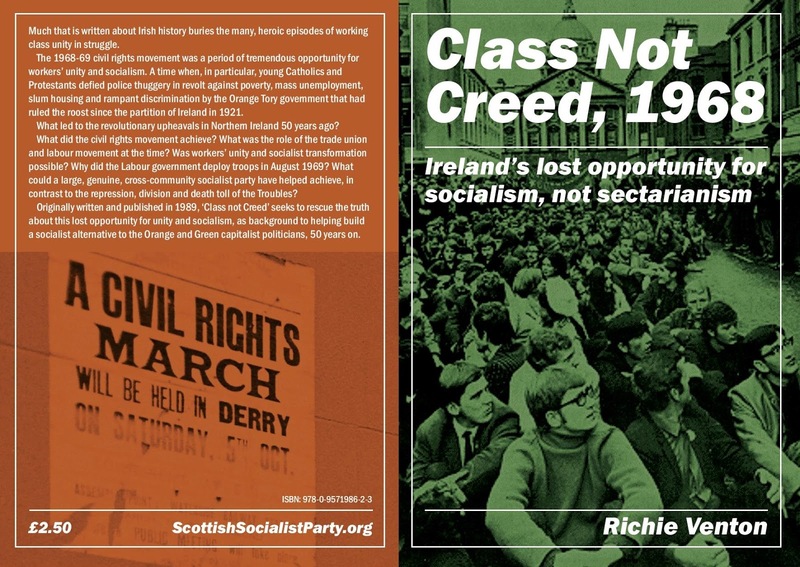 The tragic missing factor of a powerful, determined and conscious socialist party, rooted in the unions and working class, was made all the more painful and dire in its historic consequences in the years immediately following the Limerick Soviet. A contagion of strikes, workplace occupations, and land seizures spread across the island – with at least a hundred local Soviets declared, in particular the Munster Soviets (Ireland's south-west province). 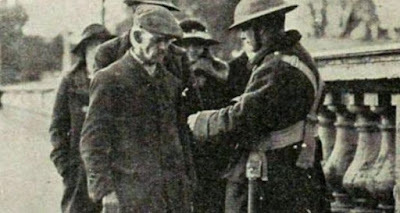 Irish Labour leaders tried to quell workers’ (including their own members’) revolutionary revolts, and met with and collaborated with the nationalist, pro-capitalist Sinn Fein leadership who ruled the Dail from its declaration in January 1919. The latter nationalists routinely used Republican Courts and armed force – sections of the IRA (both those for and against the Treaty, during the Civil War) and then the Free State Army – to evict and smash up land seizures by land labourers, and workplace Soviets. On occasions they kidnapped their leaders and held them hostage to enforce return of the landed estates to the big landowners. All this was an uncanny vindication of James Connolly’s warnings to his Irish Citizens Army, as they headed out to stage the 1916 Easter Rising, to hold onto their guns in the unlikely event of victory, as they would later have to deal with the very different class aims of the Irish Volunteers! 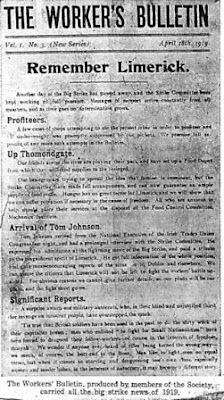 The Limerick Soviet – certainly for most workers in Scotland and Britain – is as little known of as the mighty, united general strike by Belfast workers in January/February 1919, which involved a massive 60,000 workers, lasted four weeks, involved Protestant and Catholic workers taking control of the city... and was likewise branded ‘a Soviet’ by many of its terrified capitalist enemies. Both were part of a wave of workers in revolutionary challenges to their capitalist masters, British and Irish, that swept the land - particularly from 1918 to 1923. How different Ireland and its subsequent history could have been, with a trained, experienced socialist leadership, deeply rooted in the workplaces and on the land. And how different this course of events could have been in Britain, and indeed Europe, had the spirited Irish workers been equipped with a socialist party in their midst that had been capable of seizing the opportunities for building workers' power and a socialist Ireland. It would even have potentially ended the isolation of the young Russian workers' and peasants' state, preventing that isolation from breeding the cancerous tyranny of Stalinism a few years later. So anyone who today is serious about wanting to challenge the poverty, inequality, repression and exploitation that is the very nature of the capitalist beast, should help lift the blanket of silence thrown over the Limerick Soviet and similar events. Learn from them, be vastly encouraged by them, and rededicate themselves to helping create the organised socialist party required, a century on from Limerick, to help complete the socialist transformation that our predecessors caught a tantalising glimpse of in their heroic struggles.